This Time, by playwright Sevan K. Greene, directed by Kareem Fahmy, is a play about an idealized Egyptian past and its devastating consequences on a harshly realistic Canadian present. Inspired by stories from the book Not So Long Ago by Amal Meguid, and developed through a workshop collaboration with Kareem Fahmy, this part-memory play, part-American realist drama harkens back to the “golden age” of 1960s Egypt. The play is also inspired by the life of Kareem Fahmy’s Egyptian grandmother. Despite the time shift from 1962 Cairo to 1992 Toronto, Greene writes in his script that, “though the play deals with two timelines it should never feel as if one is the past and the other the present. Both occur now. There are no ghosts and no memories. Lights, colours, and sounds should delineate both worlds.”[i] Fahmy’s able direction largely fulfils this playwright note, but the production clearly and necessarily dealt with these two timelines seamlessly. We meet Younger Amal in 1962 as a married mother of two, bored at a socialite party in Cairo. She meets Nick, a handsome Canadian teacher who is obsessed both by women and liquor. Nick instantly falls for her despite her protestations, and it is clear that the couple are destined for a tortured love affair. In the present, an older Amal is living with her divorced daughter Janine (who was born of Amal’s broken marriage). Janine, separated from her own husband, has decided to move out of her home and start anew, consumed by anger toward Amal for leaving her father and brother decades earlier. For her part, Amal is now an elegant and suave older woman who swears Nick hiding in the bushes outside her daughter’s home. As the play progresses we see the passion and dysfunction of Nick and Amal’s love affair and marriage, and how Amal’s decision to leave her children has permanently ruined her adult relations with both of them. The play conflates the past and present, leaving the audience wondering how the characters will find a way to move forward. Sevan K. Green’s This Time, directed by Kareem Fahmy. Photo by: Al Foote III. The Sheen Center’s Black Box Theatre was a perfect venue for the production. The semi-realistic set design, replete with projections, nicely conveyed Cairo’s past and Toronto’s present. 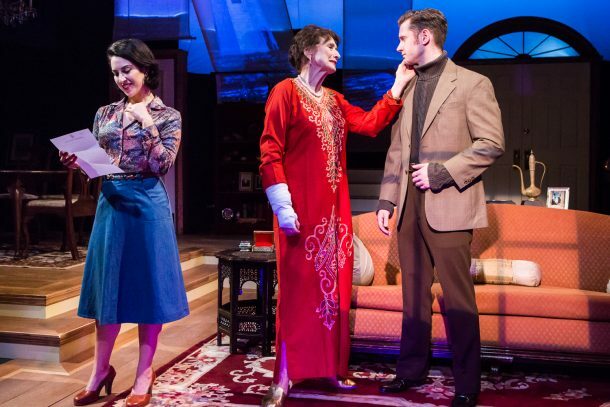 Scenic designer David Esler created a functional ground plan that captured the domesticity of Janine’s present, but not so completely that the audience could not be transported to Amal and Nick’s past. Sarafina Bush’s costume designs beautifully conveyed the characters, with Young Amal entering and exiting with a new dress in each scene of the play. Scott Bolman’s lighting design, Mark Van Hare’s sound design, and Jess Adams’s props design were precise to the various periods. No projection designer is mentioned in the program. Although the projections were well rendered, I was dismayed when I saw that the Arabic projected onto the scrim was incorrectly written—the letters were not connected properly and the script was backward. This was an unfortunate oversight; as Arab American artists, we should insist that Arabic is not just utilized for decoration but rather as a means of correctly conveying Arab culture. The acting was excellent throughout the production, the casting was quite perfect, with three of the five actors of Middle Eastern descent. Rendah Heywood’s Younger Amal was stunning both in her ability to convey Amal’s free-spirited nature, her underlying guilt about leaving her family behind, and her allure. Delphi Harrington’s (Older) Amal nicely captured her elegance, grace, fragility, and fierce defiance at those who might unfairly judge her for her past actions. As Nick, Seth Moore found the perfect balance between being suavely debonair and wantonly alcoholic; I felt for him when he pleaded with Amal to stay with him while simultaneously despising him for keeping her so jealously guarded for himself. Salma Shaw’s Janine was appropriately angry, hurt, and confused by her life situation, however, she rarely showed other aspects of her character. This fact may be attributed to the script which rarely allows Janine to find lighter moments, however, it would have benefitted her character had we seen more levity in her portrayal. Ahmad Maksoud adeptly played three distinctive roles: Monsieur Joseph, Hatem, and Tom. His portrayal of Amal’s son Hatem was the most successful of the three as he captured the sense of Hatem’s alienation both in Canada and in his troubled relationship with his mother. Fahmy’s direction was clear, precise, and acute. The play flowed incredibly well and the shifts between time periods were seamless. An especially excellent scene, titled by Greene in his script as “The Dinner Cantata,” which featured Younger Amal, Amal, Nick, and Janine all speaking simultaneously across time periods, was beautifully orchestrated. Overall, Fahmy brought the requisite care and attention to a work that required extra sensitivity given the cultural specificity of the play. The production was followed by a post-show discussion titled, “Casting Middle Eastern Actors: Authenticity & Specificity: A Panel Discussion.” In it, Jack Doulin, Kareem Fahmy, Dariush Kashani, Jen Marlowe, Taylor Williams (aka Sharky), and Torange Yeghiazarian all spoke to the difficulty, and need, of casting Middle Easterners in Middle Eastern roles onstage. The panel came to the conclusion that more diverse casting has occurred and is necessary, yet there is a scarcity of capable Middle Eastern actors to fill the roles. I personally believe that if theatre artists truly commit to multicultural casting (especially in New York City), they can surely find the talent necessary for filling such roles even if the artistic level of excellence must be somewhat compromised. One of the takeaways from the post-show discussion was that it was ultimately more important to cast the right actors for the roles than to cast these actors according to their proximity to the characters’ ethnicity. Also, it is clear that the Middle Eastern American community must spend more time, money, and effort in encouraging young actors to pursue careers in the arts if they wish to see greater representation in theatre, film, and television. This Off-Broadway production was an overall success. 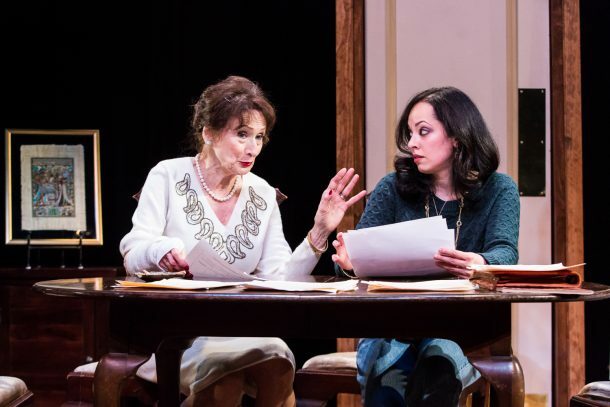 This play, which spent the better part of a decade in development and workshopping, gives American audiences a glimpse into the private lives of Egyptians who lay claim to a glorious past and are dealing with an uncertain future. Fahmy and Greene’s production is vital at this time when we need more nuanced and dimensional representation of Middle Easterners on stage. [i] Thanks to Sevan K. Greene for sharing his production script with me.